•with the various sub-menus and menu options of the Reports menu. Both of these ways include all of the same reports. The Report Browser is better for learning which reports are available, and what they do, whereas the sub-menus are better for quickly selecting a report when you already know which one you want. Now that a report is selected, the Run Report button is enabled (not "greyed out"). You can run the selected report by pressing Enter, double-clicking the name of the report, or clicking on the Run Report button. When specific reports are selected, their description is shown on the right, along with information on what data, if any, that report prompts for before displaying the report. (For instance, a range of dates.) 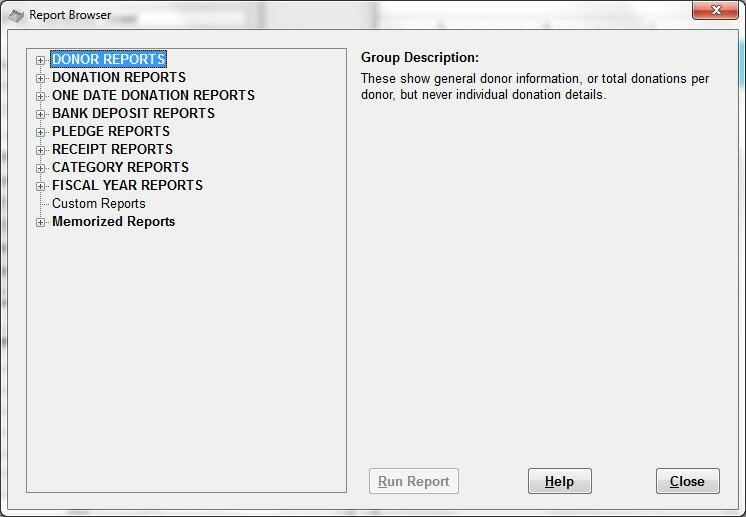 Browsing through these descriptions allows you to get a good idea of the range of reports available in DONATION, and what they all do, and to find a report that does what you need. Selecting "Custom Reports" and clicking Run Report just brings up the Custom Reports window, on which you can design a new custom report. The list under "Memorized Reports" is the same as the list in the Reports ⇒ Memorized Reports window. Under Report Description on the right, if the Memorized Report has been given a Description, it will be displayed, and if not, just the Name will be shown in that area. If you do not yet have any memorized reports, this section will not appear in the tree on the left. The free feature-limited Lite version does not support Custom Reports or Memorized Reports, so they will not show up in the Report Browser. When you are finished browsing or running reports from this window, click Close (or press ESC) and it will close. As a convenience, if you open it again with Reports ⇒ Report Browser, during the same run of DONATION, the tree will usually be open to exactly the same place it was open when you closed it. Like the options on the Reports sub-menus, if you have selected not to show the field Member/Env. 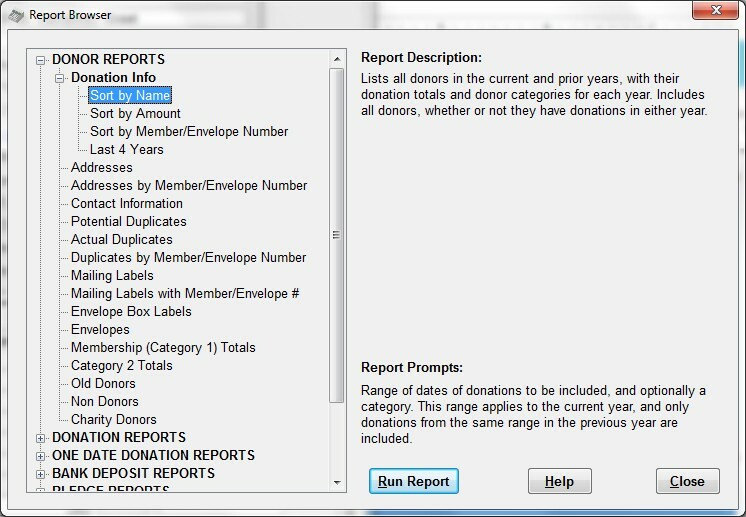 # in the Donor Details tab of Maintenance ⇒ Main Window Options, several reports that specifically include that field, such as "Sort by Member/Envelope #" and "Mailing Labels with Member/Envelope #" in the example window above, will not be shown, since they are not relevant if you aren't using that field. Various other options and settings in the program also affect which reports can be seen. For instance the Fiscal Year Reports cannot be listed or used if they are not appropriate (see the Fiscal Reports Sub-Menu page for details).